David Luiz took the limelight over the weekend not because he had done a great job at Chelsea. He was in the news for the opposite reason. The 30-year-old central defender from Brazil was red-carded in their Premier League match against Arsenal during a 0-0 draw at Stamford Bridge. So he was sent off for his high-boot lunge on left-back Sead Kolasinac in the last three minutes. It was the first-ever Premier League red card for Luiz, who made the violent tackle in front of the Chelsea bench, as he will be suspended for the Blues’ next three domestic fixtures. His miscue and eventual showing of the card was accepted by Chelsea, much more their manager Antonio Conte. 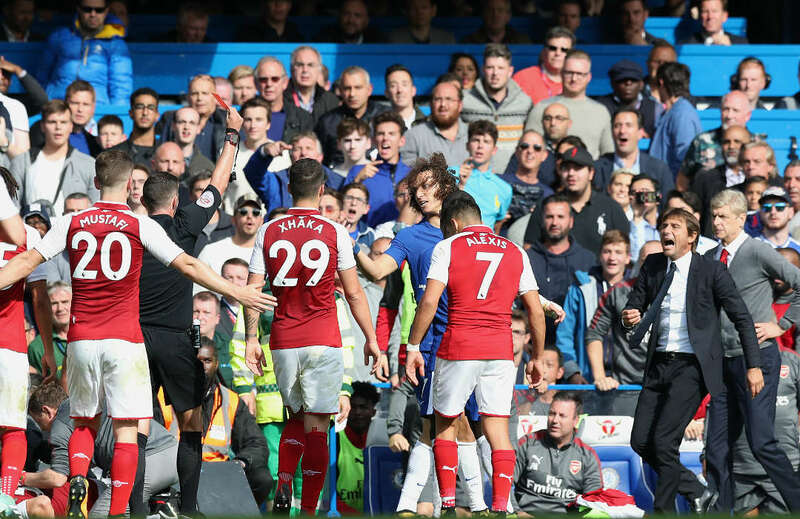 The Blues boss said they won’t make an appeal, despite insinuating Luiz was fouled by Alexis Sanchez in the buildup to the tackle on Kolasinac. Suspended Luiz missed last Thursday’s EFL third-round game against Nottingham Forest, and will be out for their Premier League games against Stoke City and a crucial match against Manchester City at Stamford Bridge. Luiz is considered as Chelsea’s pillar in defence. His absence in their coming three games could be a blow for the Blues, unless Conte taps in a suitable player to fill the void. As for Luiz, he should learn a lesson well for that red card. Without him to menace enemy attackers, Chelsea defence would be tested to the hilt. But that would be up to Conte to worry about. In the meantime, Luiz should chill out at the moment and ponder things and what better things to do when he returns to action for the defending Premier League champions. Best thing would be if he concentrates and be ready to play despite a wrist injury when they visit Atletico Madrid for a group stage match in the Champions League next week.